The Nigeria Army has commissioned its oil and gas filling station recently built in Minna, Niger state capital. Chief of Defence Staff, General Gabriel Olonisakin commissioned it over the weekend. The fuel station which runs under Nigeria Army Property Limited (NAPL) is an 8 pump oil and gas station built along Bakungu bye pass Minna. The fuel service station has four pumps for petrol and one each for Diesel and Kerosene including a Supermarket and a Mechanic Workshop. It will operate a 24-hour service daily. 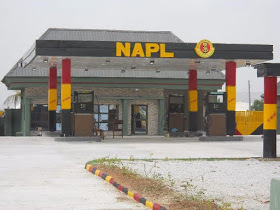 The Management of NAPL revealed that the Minna Oil and Gas station is one among the ones NAPL Mega Stations the Army intends to establish across the 36 states of Nigeria and a super mega station of 56 pumps in Abuja, the Federal capital territory.